Following up on a story reported by the Vancouver Sun, a Canadian man must pay nearly $40,000 (CDN) after failing to declare his $81,510 (CDN) at Canadian customs. The man pleaded guilty on May 29 attempting to paying duty on his watch which raises the question on whether to declare or not declare your new Rolex watch at customs when entering the United States or any other country. When entering the United States with your newly purchased Rolex, there are two areas with which you have to navigate. The first is the Rolex trademark and the second is the U.S. Government duty on imported items. Rolex owns the trademark, as well as the import rights to anything Rolex that enters the United States. According to US Customs, an individual can hand carry one Rolex from a trip overseas without permission. Carrying more than one Rolex watch from outside of the country is a trademark violation of Rolex U.S.A. and they can be impounded. Additionally, bringing in a fake Rolex from overseas is also a trademark violation and will be seized. Also, if you are thinking about ordering a Rolex from overseas and having it shipped to the States, keep in mind that it is also a trademark violation of Rolex U.S.A. Plus, Rolex U.S.A. is a separate Rolex S.A. spinoff and has these restrictions put in place in order to stem the tide of fake Rolex watches. This is because they are the most copied watch on the planet. It also ensures that Rolex watches destined for the United States are purchased from Authorized Dealers in the United States. So, you are on your way back from a great trip and are not sure whether to claim your newly purchased Rolex for duty. You purchased one Rolex watch, which you are hand carrying, so you have Rolex U.S.A’s blessing. However, when presented the green customs card on the plane or ship, the question usually comes up as to what to do. If caught smuggling a Rolex past customs, you can be fined six times the duty of the watch or the price of the watch itself. Additionally, if you going through customs just coming off a plane/train from a vacation destination, the customs agents know what to look for when scanning luggage as well as wrists. Even though Customs Agents reportedly look for illegal drugs being smuggled, other items such as high priced watches or diamonds stand out when standing in the customs line. Rolex U.S.A really wants you to purchase a watch in the United States, and the pricing, laws, and availability make it easier to do so. Beckertime is a great place to shop for such a watch. 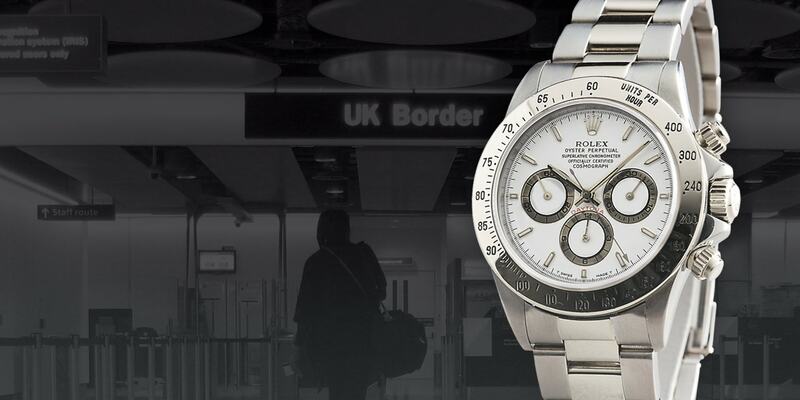 Rolex U.S.A trademark restrictions allow U.S. vendors or citizens to ship a Rolex to a destination outside of the United States, which Beckertime does many times successfully to many overseas clients.